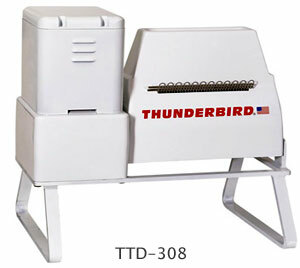 Whether for use in supermarkets, butcheries, restaurants, hotels or private kitchens, our assortment of Thunderbird meat grinders has the machine that fits your needs. Our meat grinders made of stainless steel come with a cross knife, hole discs with different sized holes, a filling bowl, a plugger and a sausage filling attachment. Every one of our machines strictly complies with hygienic standards and is easy to operate.